Today’s welcome committee includes six young men who sit in the open-air lobby attacking tall, carved drums with slender sticks. Their fever-pitched percussion drowns out the airplane engine’s whine. Loved ones greet one another with a crush of flowers: fat hei (garlands) made with tiare, ylang-ylang and hinano, the signature scents of French Polynesia. Mohea Doom rescues me from swooning and shuttles me to Wipa Lodge, her family’s pension. I’m the sole guest aside from two friends visiting from Tahiti. “We’re about to leave for a picnic,” Mohea says. “You’re welcome to join us.” Within an hour we’re gliding across the glass surface of Tubuai’s lagoon. Mohea’s father, Willson Doom, steers the small boat, two baguettes balanced above the wheel. The two archipelagos that make up the Austral Islands lie at the southern extreme of French Polynesia. Isolated and lightly visited, these islands have preserved a unique identity and lifestyle that’s intimately connected to the past. Above, with 2,100 residents, Tubuai has the largest population in the Australs. Willson has a dreamer’s demeanor: a soft smile and large, dark eyes that either look over your shoulder or straight into you. He delivers us to Motu Roa, an uninhabited islet at the outer edge of the lagoon, and ties up to a coconut palm. He naps in the shade while the rest of the group kayaks through water so clear, individual corals can be identified without a snorkeling mask. For lunch we eat grilled parrotfish sandwiches. Mohea entertains us with renditions of neighbor island accents: the soft drawl of Ra‘ivavae and the clipped bark of Rurutu. “They sound like they’re angry with you in Rurutu,” she laughs. Tubuai, Ra‘ivavae and Rurutu all belong to the Austral Islands, a little-visited archipelago four hundred miles south of Tahiti. Though it’s part of French Polynesia, this remote island chain is a world unto itself, where traditional Polynesian culture thrives. Unlike the honeymoon destinations up north, there are no over-water bungalows or spas here, no restaurants or boutiques. ATMs are scarce and often empty by the weekend. The thousand or so tourists who visit each year stay in family-run pensions and integrate into island life. Mohea’s friends confirmed: While most of the world daydreams about Tahiti, Tahitians dream of the Australs. Until the 1970s the only way to travel here was by private boat or hitching a ride aboard Tuha‘a Pae, the cargo ship that calls twice a month. In 1972 the French government carved a small airstrip into Tubuai’s coast. Now flights from Papeete stop here en route to the equally small runways on the neighboring islands. Air traffic is still something of a novelty. Air Tahiti’s fifty-seat turboprops touch down just a few times a week. When they do, locals line up alongside the airport fence to wave hello to friends passing through. A ceremonial paddle carved with the starburst pattern characteristic of Austral Island art. Each of the five inhabited islands has its own allure. Tubuai is the largest, home to 2,100 people and 200 ancient marae (temples), including some of the most intriguing in French Polynesia. Both Tubuai and nearby Ra‘ivavae are mountainous, surrounded by turquoise lagoons and ringed by white, sandy motu (islets). 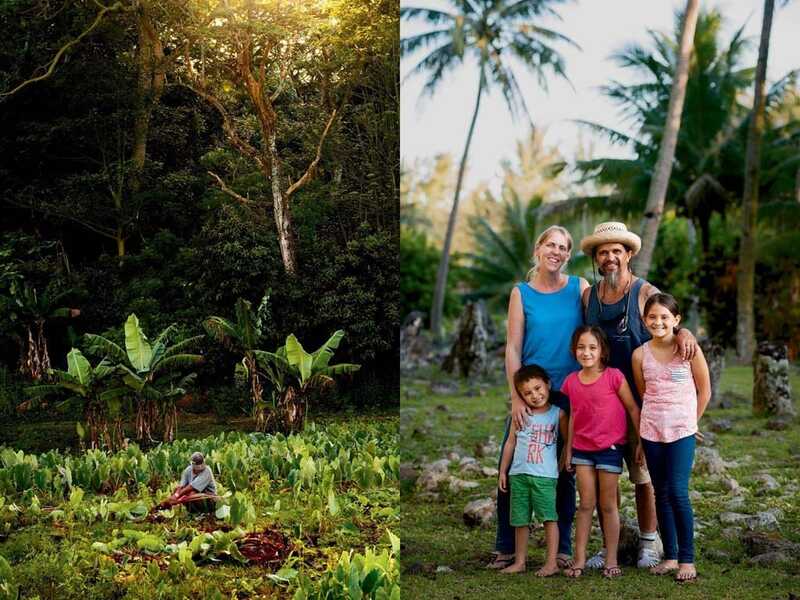 To their west, Rurutu is the taro-growing capital of French Polynesia, known for its sprawling patchwork of green fields, limestone cliffs and caves, and the humpback whales that crowd its bays each winter. Little Rimatara measures just three square miles but boasts two colorful endemic bird species. Its airstrip wasn’t built until 2006. Far to the south, Rapa remains accessible only by boat. It’s the most isolated, with the most pristine marine ecosystem. Seafaring Polynesians populated these islands some two thousand years ago during the golden age of transpacific voyaging. Over the ensuing millennia, self-sustaining communities evolved, with unique and sophisticated cultural practices. Though small, the Australs have contributed disproportionately to Oceanic art. 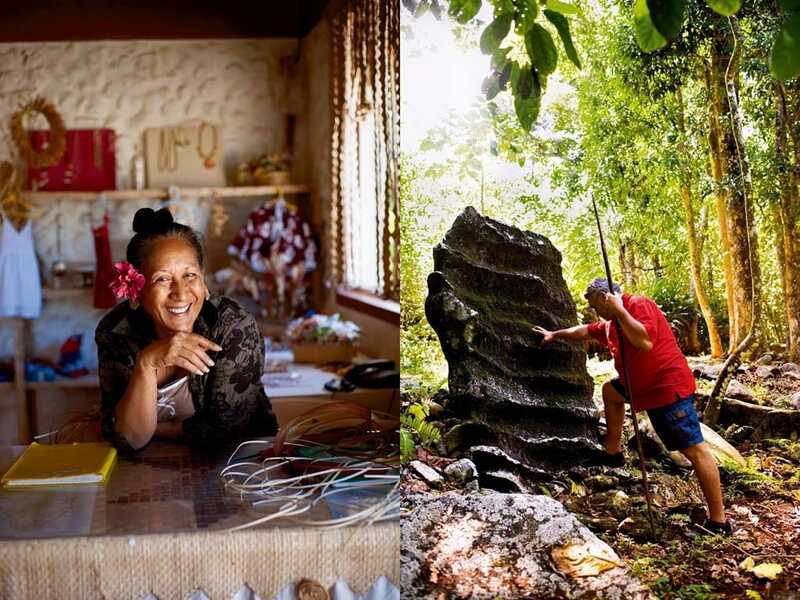 International collectors covet the intricately carved ceremonial paddles, beautifully woven pē‘ue (pandanus mats) and the chalk-white coral penu (poi pounders) for which this archipelago is known. Western ships arrived at the end of the eighteenth century. Captains James Cook and George Vancouver were the first Europeans to pass through, followed by a few mutineers from the HMS Bounty. (Christian Fletcher tried to establish a fort on Tubuai, but islanders drove his mutinous crew away after just two months.) Contact with Western sailors proved catastrophic for Austral Islanders: By the time missionaries began arriving in the early 1800s, 90 percent of the native population had perished from introduced diseases. Rapa’s population plummeted from 2,000 to just 120. Little wonder that the survivors jettisoned their old gods for new ones: Austral Islanders surrendered their great wooden tiki to the missionaries, who publicly burned them. For decades France and England played tug of war over the Australs. By 1900, France had claimed them all. Yet despite these devastating epidemics and political upheavals, Austral Islanders have managed to maintain cultural continuity and a distinct sense of identity. Missionaries arrived in the Australs in the nineteenth century, and their influence infused native culture. Here, church members play music and practice Tahitian dance near the village of Mataura on Tubuai. Mohea and her father know the hospitality business well. Willson started out offering boat trips like this one before opening the lodge. She worked at five-star resorts in Bora Bora, returning home to help run the family business. They’re both keen to attract more tourists to Tubuai—and conscious of how that could change the tempo of the island. At present, bikes and horses pass by Wipa Lodge as often as cars. Willson’s fascination with Tubuai’s history is more than academic; it’s personal and spiritual. Five generations of his family have lived here, seven when he counts his grandchildren. “I have two kinds of information,” he says, leaning against the hefty wooden spear that he regularly travels with. “Scientific knowledge and the oral culture the old man gave me.” For five years Willson studied under Tai Noa, a tupuna (elder) who claimed to have seen his student’s face in a dream. “He chose me while I was in the body of my mother,” Willson says. “He said, ‘That boy has the key. Show him the door.’” Near his death Tai Noa summoned Willson and taught him the chants and sacred histories of the island. Of the five Austral Islands, Ra‘ivavae is considered the most beautiful, an undiscovered Bora Bora. Viewed from above it’s otherworldly. Shifting shades of aqua surround a tiny crop of rain-carved mountains. The lagoon glows with an opalescent fire, hemmed by a necklace of twenty-eight little islets. Some of these motu are no more than a swath of white sand. Others bristle with dense green patches of aito (ironwood trees) and seem to hover above their own reflections. Rurutu is nicknamed “the island of whales” for the tohorā, or humpbacks, that visit beginning each October to calve in the island’s protected bays. Their annual arrival draws many of the thousand or so tourists who visit the Australs each year. We bounce in Eléonore’s truck up the partially paved coastal road, nudging lazy dogs from their napping spots. She slows down to say hello in Tahitian to a passing bicyclist, but with her musical accent “ia ora na” sounds more like “yogaaaanaaaa.” On Ra‘ivavae most people pronounce “g” in place of “r.” We approach Mount Hiro—or Higo—Ra‘ivavae’s highest point, which looms over the island’s north shore. Squawking fairy terns and white-tailed tropicbirds patrol the 1,400-foot-tall stone fortress. At its base lies Anatonu: a dozen tin-roofed houses, a tall white church, a squat little magasin (general store) and Tama Resort, the pension Eléonore runs with her husband, Dennis. A few teens hunker like stray cats outside the magasin, Anatonu’s sole source of internet. At dawn the pâtisserie truck circles the island, making its morning deliveries. Sleepy islanders emerge to receive armfuls of fresh-baked baguettes—one of the blessings of French rule. Shirtless and drenched in sweat, a muscular man jogs up and down the road toting a log with sand-bags affixed to either end. He’s training for next month’s fruit-carrying race—one of the most competitive events during heiva, the annual arts and culture festival. Eléonore lays out a lavish breakfast in the common dining room: warm baguettes with pamplemousse marmalade and po‘e, tapioca flour crêpes. That night she serves steamed taro and breadfruit, reef fish simmered in coconut milk and curried octopus she caught herself. A giant Technicolor poster advertising the Austral Islands hangs over the table. The woman pictured on it, dressed in a beach vine crown and brace-lets, is our very own hostess—still a fetching model and quite the diva at close to 70 years. True to her word, she wears a different hei upo‘o every day, each more outlandish than the last. Being so isolated, the Australs’ inhabitants rely on the natural bounty of the land and sea for sustenance; here Kalei Rossi dives for clams in Tubuai's lagoon. One morning, Eléonore and I take a boat to Vaiamanu, a motu shaped like a whale’s fluke. I snorkel over clouds of fish and fluorescent-lipped clams while she combs the shoreline for cowries, tridents and little periwinkles to string into neck-laces. I have yet to see her enjoy an idle moment. After two hours she drops her harvest—forty pounds of shells—onto the sand and wades into the luminous water. “How could you go wrong?” she asks. More statement than question, this oft-repeated Eléonore-ism is her way of saying life on Ra‘ivavae is idyllic. On the way back to Anatonu, we visit the Australs’ sole surviving tiki. Ra‘ivavae once possessed the largest stone tikis outside of Rapa Nui (Easter Island). When Christian missionaries first anchored here in 1819, they confiscated these “false idols” and either destroyed them or shipped them back to Europe. One tiki reportedly didn’t want to go and “jumped” off the boat. Superstitious fishermen still avoid the spot where it landed in the lagoon. Three Ra‘ivavae tiki now preside over the gardens of the Paul Gauguin Museum on Tahiti. The tallest is nearly nine feet. The tiki in front of us is half that size though still exceptional. “She was carved from red stone because it has mana [power],” Eléonore says, draping a shell necklace over the tiki’s head. “She’s beautiful. Plus, she’s smiling. You don’t see too many tikis smile. She has style.” Indeed, both the stone woman and her human counterpart wear the same high hair bun and wide, dropped neckline. Eléonore isn’t the only one on Ra‘ivavae with a collection of traffic-stopping head-gear. The latest fashions are on display at a farewell party for the Anatonu church minister. While pure white pandanus hats are de rigueur for church service, for a festive occasion like this, most ladies prefer hei upo‘o. Eléonore sports a flurry of silk orchids, while her sister wears a ring of delicate roses made with shiny strands of pūrau fiber dyed pink. Several men wear tropical bowlers woven with light and dark pandanus. Pampas grass plumes, pinned above the ear, appear to be the embellishment du jour. Thus finely attired, the congregation packs into the community center where a band belts out Tahitian hymns at full volume. “They sing with their heart,” Eléonore says into my ear as we squeeze into seats at the overloaded banquet table. Each family has contributed a specialty dish—or four—to the feast. There is enough poisson cru, steamed taro and po‘e for several send-off meals. Eléonore nudges me, indicating which plates she plans to take home as leftovers. After dinner everyone lines up to present the departing preacher and her family with hand-strung shell necklaces—so many that the preacher’s husband looks ready to collapse under their weight. Originally from Wales, Elin fell in love with the Australs and stayed to start a pension with the taro-farming, horseracing Viriamu, seen here out for a sunset ride along Rurutu’s lagoon. “People thought I was slightly mad,” she says. The party continues the next day at the airport. Nearly half the island’s population turns out, arms laden with fresh hei. Kids clamber up the fence, scanning the sky for the plane. Church members sing in the snack shop. The travelers are dressed to impress, in matching floral prints and even more spectacular headgear than the night before. One woman’s flower-studded headband features a full fern—sprays of fronds burst from the back of her head. A stern-faced older gentleman sweats beneath a splendid wreath made entirely of chartreuse ylang-ylang blossoms. Once aboard the plane, a great deal of jostling ensues to accommodate bulging bags and hat brims that extend well into the aisle. For this crowd, leaving home is still a grand adventure. Rurutu is a geological anomaly. Born twice, it formed during two separate volcanic events. The initial volcano rose from the sea twelve million years ago. Over time it eroded away, leaving a ring of coral in its wake. Ten million years later a second volcano emerged in the same spot, heaving the old reef above water and creating a singular landscape of fossilized limestone cliffs and caves. 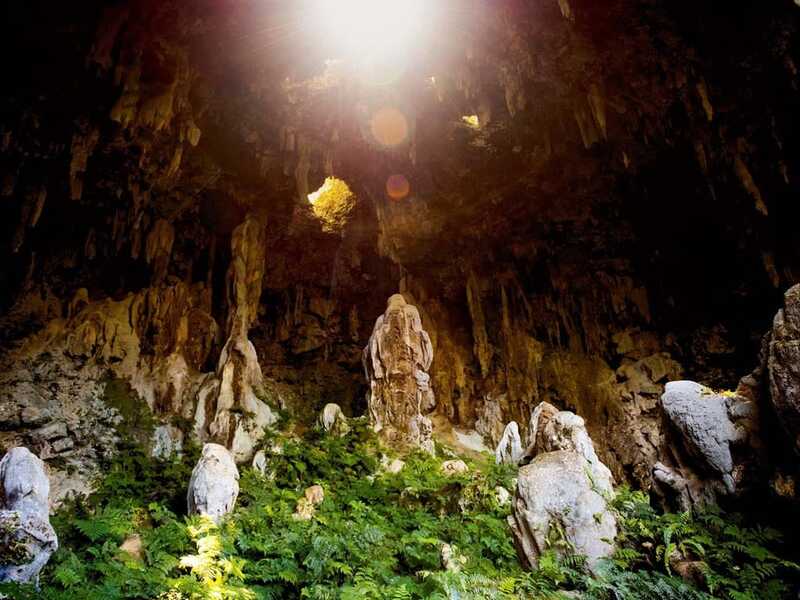 Rurutu’s first human inhabitants lived, worshipped and entombed their dead inside these caverns. I arrive on Rurutu just ahead of a storm. Elin Teuruarii welcomes me into her home as thunderclaps rend the darkening sky. Each deafening drumroll sends her three children shrieking down the hallway. Unperturbed, she heats water for tea and sits down to chat. If anything, the dash of wet, cold weather is familiar to the Welsh-born mom. After graduating from Cam-bridge, she came to French Polynesia to pursue a doctorate in entomology. Weevils are surprisingly diverse on Rurutu. Some-how these flightless insects managed to colonize the most remote reaches of the Pacific long before humans. Elin was decoding this mystery when her attention was drawn elsewhere—toward Viriamu Teuruarii, a taro-farming, horse-racing descendant of one of Rurutu’s old royal clans. They fell in love, married, had three kids and opened Teautamatea Pension. “People thought I was slightly mad,” Elin laughs. Their wedding was a spectacular affair, involving dozens of bridesmaids and groomsmen and two other couples. Traditional Rurutu marriages happen just once a generation; all of the adult children in a family wed on the same day. Elin and Viriamu exchanged vows alongside two of his younger brothers and their brides. The days-long celebration included a procession into the nearby town of Avera, multiple feasts, dance performances and twenty-five costume changes. Each family on Rurutu gave the newlyweds a new set of clothes, plus stockpiles of food, woven pandanus mats and other handcrafted heirlooms. Guests received invitations to the big event a full year in advance, allowing them enough time to amass the necessary gifts. Taro remains a staple food throughout the Austral Islands, and Rurutu is regarded as one of the taro-growing capitals of Tahiti. Up to twelve varieties of the starchy root vegetable are cultivated in centuries-old ditch-and-berm systems. Here, the forest encroaches on a taro field near the village of Avera. Known as A‘a, the statue is considered one of the most significant works of art in all of Polynesia. The three-foot-tall wooden image of a man has thirty human figures protruding from his body, forming his eyes, mouth, ears and other features. A‘a resides in the British Museum, though a dozen bronze casts were made and distributed. Picasso had one; another is here at the mayor’s office. When the missionaries first received him, two dozen smaller objects were inside his hollow cavity. Most likely he was created to hold the bones of a deified ancestor—one of Viriamu’s relatives. Which means that Elin didn’t just marry into royalty, but divinity. She scoffs at that suggestion but admits that her husband and his brothers do exhibit a certain godlike panache during Rurutu’s annual horse race. As president of the island’s equestrian association, Viriamu hosts the hot-blooded competition each year during the month-long heiva. Bare-back and barefoot, riders urge their finest steeds down the beach, sending sand flying. The Teuruarii family’s other legacy is less thrilling to watch but just as impressive. Hundreds of years ago Rurutu farmers channeled mountain streams to flow past their taro plantings before reaching the sea. The fields at Vaiavai have been in continuous cultivation ever since. Descendants of more than twenty families tend plots here, including Viriamu and his brothers. “You can feel that this valley has been cultivated for centuries,” Elin says as we walk along the ditches separating each raised plot, ducking beneath the occasional weeping willow. Vaiavai is one of French Polynesia’s largest, oldest taro fields; its patchwork of emerald green reaches deep into the valley. Farmers grow twelve different varieties of taro here, identifiable by the color of the stem. Most farm for themselves while a few export to Tahiti. Across the Pacific, rice, potatoes and other quick-cooking starches have largely supplanted taro. Not in the Australs. Even the omnipresent baguette has failed to knock taro from center stage here. Islanders eat it with every meal, typically in steamed, nutty-tasting chunks, though also in the more traditional style: pounded into soft, doughy poipoi. That night, Viriamu invites me to help prepare the family’s poipoi. The time-consuming process involves special tools: a concave wooden board and heavy coral penu. Unique to the Australs, smooth white penu are carved from fossilized coral found on Rurutu’s coast. Viriamu piles a handful of steamed corms on his board and mashes them. After twenty minutes of methodic pounding, flipping, adding water and pounding some more, Viriamu cuts the creamy, sticky poipoi into three portions. He wraps two up in ti-leaf bundles to ferment and eat later. He mashes a few bananas into the third, scoops it into a bowl and douses it with fresh coconut milk. It tastes earthy and mildly sweet—unlike its Hawaiian equivalent, poi, which is more sour. In appreciation, Viriamu recites a short chant: Mona tei, mona tei, taro hua hua, Vaiavai! The most delicious taro with the best texture comes from Vaiavai!